How Your Brain Is Like Manhattan : Shots - Health News The human brain may be just three pounds of jelly. But it turns out that jelly is very organized. New scanning techniques show that the brain's communications pathways are laid out in a highly ordered three-dimensional grid that look a bit like a map of Manhattan. It turns out your brain is organized even if you're not. At least that's the conclusion of a study in Science that looked at the network of fibers that carry signals from one part of the brain to another. Researchers used cutting-edge imaging technology to look at places where these fibers intersect. And they found a remarkably organized three-dimensional grid, says Van Wedeen of Harvard Medical School, the study's lead author. The grid is a bit like Manhattan, Wedeen says, "with streets running in two dimensions and then the elevators in the buildings in the third dimension." Wedeen says once he saw evidence of the brain's grid system, a lot of things began to make sense to him. "I'd been looking at pictures of these monkey brains for years without being able to understand why the fibers were so often looking like sheets, why the curvatures were so well behaved and so organized," he says. The grid model could help answer a question that has baffled geneticists and biologists for years, Wedeen says: How can a relatively small number of genes contain the blueprint for something as complex as the human brain? The answer may be that in a highly organized grid system with consistent rules, a genetic blueprint doesn't have to describe every detail of the final product, he says. "The grid structure shows how simple recipes can produce a very complicated outcome," Wedeen says. The grid also may help explain how the rudimentary brain of a flat worm evolved into the complex brain found in people, Wedeen says. The grid system, he says, would allow a species to gradually add new functions to its brain much the way an architect adds extra floors to a building or a city planner adds new streets. "So you actually see the tools through which evolution builds a complicated human brain from more simply constructed ancestral brains," he says. Not everyone thinks it's that simple, though. The results of the new study are surprising and intriguing, but not yet certain, says David Van Essen, a neuroscientist at Washington University School of Medicine in St. Louis. "The evidence for their hypothesis is strong to some degree," Van Essen says. But he adds that "in a couple of important ways I think they may have oversimplified the story." Take all those 90 degree intersections, for example. Other studies show that the brain's structure also includes some diagonal pathways as well, Van Essen says. So he says it's possible the brain is neither pure spaghetti nor a perfect grid. "I expect it will turn out to be somewhere in between," he says. A definitive answer about the structure of the brain's wiring probably isn't far off, Van Essen says, thanks to something called the Human Connectome Project. 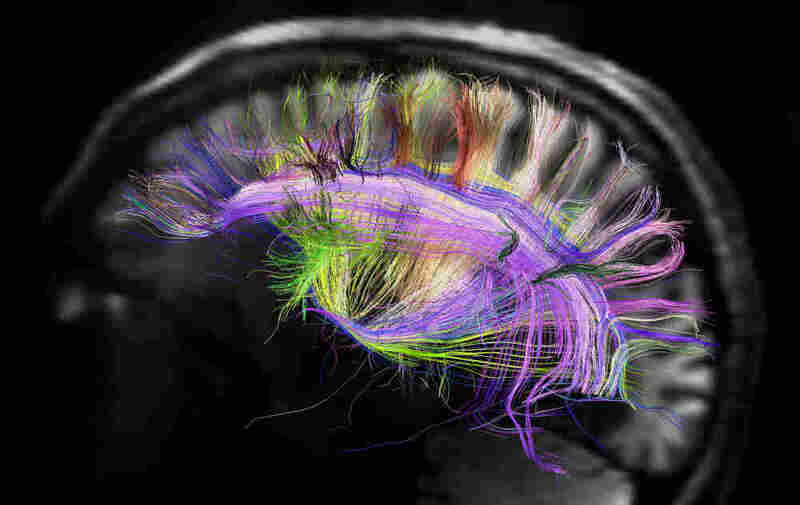 It's a five-year brain-mapping effort supported by the National Institutes of Health. Those findings should help explain how our brain wiring makes us who we are, Van Essen says, and what goes wrong in disorders like autism and Alzheimer's disease.